The labels on packaged food are for information—not moral judgment. I feel guilty that I don’t call my grandparents as often as I should, that I distract myself from world events by obsessing over panzanella, and that I take too many not serious things too seriously and too few serious things seriously enough. I don’t feel like my choice of popcorn—or chicken salad, or guacamole, or mac and cheese, or brownies—deserves a place on my guilt list. I go to Trader Joe’s to buy groceries because it’s three blocks from my apartment and has the most reasonable prices in the neighborhood. I do not go for self-condemnation. 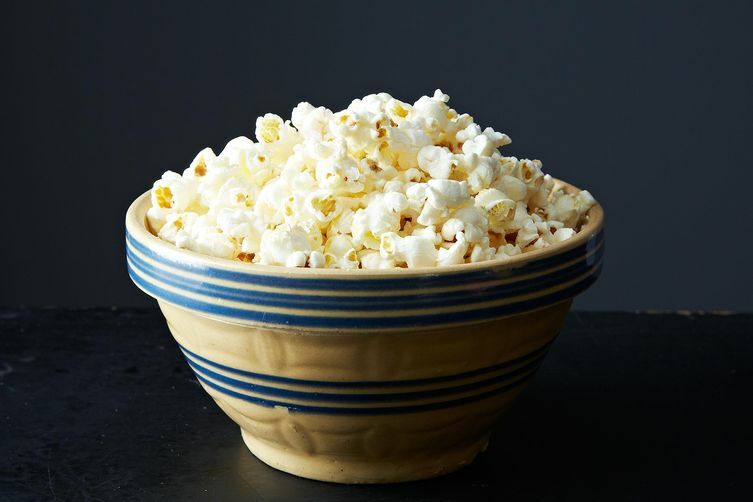 Yet when I see two versions of popcorn—one with herbs and spices, the other with "reduced guilt"—I immediately feel like a moral verdict is being returned. Of course it's not news that food is inextricably linked to value judgment. Why else would we have sinful brownies and indulgent grilled cheese sandwiches? But with both popcorns positioned right next to each other in the store, I have to make a decision right then and there: Can I handle taking on extra guilt in my life right now? How's my wickedness level this week? Maybe the popcorn packaging wouldn’t bother me as much if it were a free pass. But this isn't guilt-free—it's guilt-reduced. I'm going to feel guilty either way, TJ's tells me; I just have to pick my order of magnitude. I already experience a deluge of feelings when I'm grocery shopping (especially when it's 8:45 P.M. on a Sunday night and my toes just got run over by a shopping cart); I don't need the food labels to weigh in. Is there a reason why the reduced guilt popcorn costs $.30 less than the more offensive one, I wonder? Perhaps that penny-pinching is just another thing to feel reduced-guilty about. Just last night I posted this on Facebook: "I hate it when people describe food as "guilt free". You should never feel guilty about eating any food ... unless you stole it off someone." Why don't you give your grandparents a call? I do hope this was written tongue in cheek. I'm fairly certain that TJ's really doesn't intend to make any moral statements whatsoever in this packaging, but rather, they've figured out that "reduced guilt" (i) is a bit more clever sounding than "reduced fat" or "reduced sodium"; and (ii) gets people curious about why the product is described that way, which leads to more people picking up the package, which leads to more people putting those packages in their baskets. TJ's is just trying to get people to buy their stuff, the way e-commerce and ad revenue reliant sites put their energy into getting people to click. TJ's, like Food52, is not an eleemosynary institution. The lawyer in me also suspects that "reduced guilt" can be used where federal labeling laws would not allow TJ's to say "reduced fat" (25% less fat than the original version) or "reduced sodium" (25% less sodium), but I haven't compared any labels to confirm that. Thank you for reading this! I understand all of your valid points, and I'm aware of the forces of marketing and advertising and revenue-generating. And Trader Joe's does have my business. I am sure that their packaging is not malevolent in any way, but it still bothers me that a company would play into the idea that certain foods should make us feel "guilty." It just doesn't seem necessary to me. I understand that this isn't a serious or pressing matter, but it's something I've been thinking about that I wanted to write about. I chuckled when I saw those packages the first time, because I immediately assumed the labeling-law workaround mentioned above, but also because it seemed as if TJ's was making fun of of all of the reduced-this, and that-free stuff the market seems to want. But have you tried their dill pickle popcorn yet?! I have not! Guilty as charged.